While Ferrari "separating" from Fiat is a slightly silly notion given that it's basically being sold to the same people who already own it, the cash implications for Fiat — who needs the cash — are not silly. As Bloomberg's Tommaso Ebhardt reports, FCA's own filing estimates that they'd transfer about $2.8 billion in cash to themselves before selling the company. 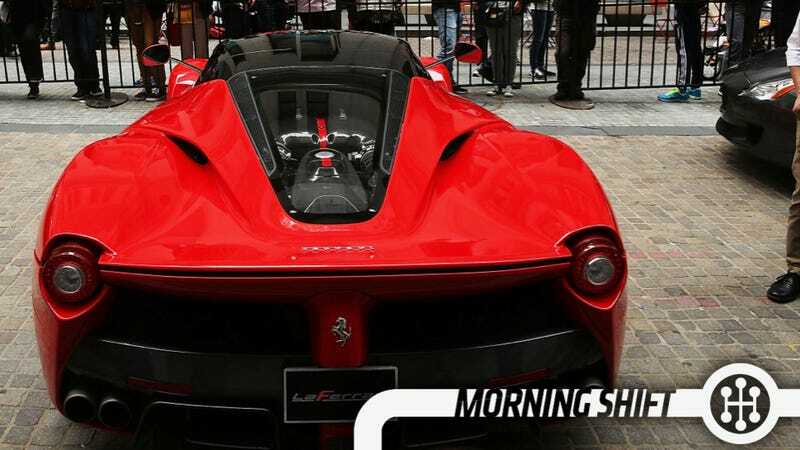 The 10% being sold on the market will hopefully go to make up some of that and give Ferrari money to invest in itself, since their R&D budget is now FCA's R&D budget. The death toll from the Takata airbag crisis has no reached five, with the first fatality outside of the U.S. reported. In the Malaysia accident on July 27, involving a 2003 Honda City model, the air bag inflator ruptured and sent shrapnel into the vehicle, some of which struck the female driver, Honda said. Honda did not give the driver's name or age. Honda learned of the incident on Aug. 27 and notified Japan's transport ministry on Sept. 10. From everything I've seen, the NYT's Hiroko Tabuchi is a straight-up reporter and, while her damning report on Takata does fall on anonymous sources, Takata has done nothing to convince me that the report they secretly tasted their airbags and destroyed the evidence isn't true. The statement says that Takata’s engineers in the United States did not learn of the first episode involving an airbag with the defect — which can cause an airbag inflater to rupture when it deploys in an accident, sending metal fragments into the car’s cabin — until “the middle of 2005.” The event involved the crash of a Honda Accord in Alabama in May 2004, injuring the car’s driver. You're going to have to do better than that Takata. While many car dealers are on the wrong side of awful, I'll credit AutoNation and their CEO with trying to be forward thinking on a range of issues — including Tesla. Exactly. So what AutoNation is offering is the ability to find a car online, reserve the price, put a hold on it with a credit card, and go in and pick up the car. The big automaker groups got together this week to say that they're "pledging" to protect the massive amounts of data that they're suddenly intaking with their new cars. They say they will protect information about location and driving behavior. Automakers said in the 19-page submission that they are committing to protect driver location and driver behavior data. It comes as concern grows that vehicle services collect significant data at times that could be tapped by marketers, government officials or others. The car companies are committing to be transparent with drivers about what data is collected and requiring that drivers opt in to programs that include data collection. They also pledged to minimize data, to hide the identity of drivers and to only collect data for "legitimate business purposes" and only with driver consent. They pledge to follow the principles for all vehicles and programs no later than the 2017 model year. They also pledge to work with vendors to ensure they respect privacy. On this day in 1974, 28-year-old Karen Silkwood is killed in a car accident near Crescent, Oklahoma, north of Oklahoma City. Silkwood worked as a technician at a plutonium plant operated by the Kerr-McGee Corporation, and she had been critical of the plant's health and safety procedures. In September, she had complained to the Atomic Energy Commission about unsafe conditions at the plant (a week before her death, plant monitors had found that she was contaminated with radioactivity herself), and the night she died, she was on her way to a meeting with a union representative and a reporter for The New York Times, reportedly with a folder full of documents that proved that Kerr-McGee was acting negligently when it came to worker safety at the plant. However, no such folder was found in the wreckage of her car, lending credence to the theory that someone had forced her off the road to prevent her from telling what she knew.